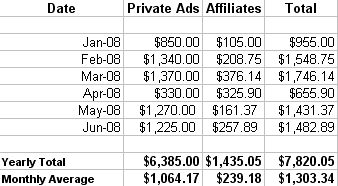 In my previous blog earnings update, I had predicted that income from TylerCruz.com in June would be in the $1,500-$1,600 range. Unfortunately, it wasn’t and I fell a bit short, bringing in a total of $1,482.89 which is my 3rd best month to date. It’s a shame – I didn’t receive a single paid review during June. If I had sold only two paid reviews, June would have set a new month record! I’ve heard that paid reviews have been slowing down in the Make Money Online blogosphere lately. I’m not sure why, if anything they should be increasing. I’ll be launching a new kind of paid review on my blog soon, so hopefully that will help respark the interest of advertisers. There was a new addition to my league of affiliates for June. As you know, I’ve been running a MarketLeverage contest and have so far referred 49 affiliates. They generated $3,054.20 to date, and since I get 5% of whatever they generate, I made $152.71. Hopefully MarketLeverage will continue to be a long-term source of recurring passive income. 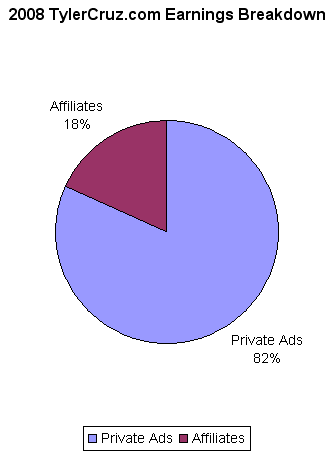 We have not seen the Private Ads vs Affiliates pie chart change for a long time. I don’t believe this to be of any concern or significance however. In fact, the 80-20% could be the perfect mix. 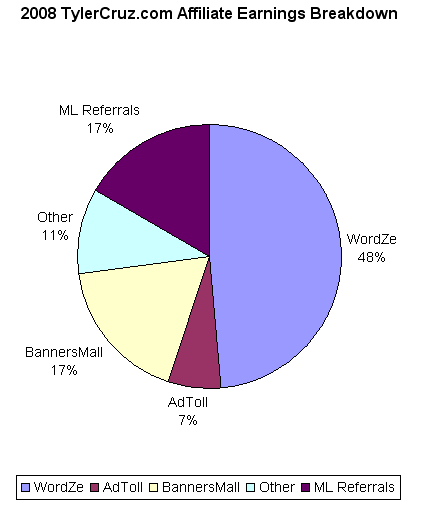 WordZe has continued to prove to be a consistent source of residual affiliate income. I only wish I catered more to affiliate marketers so I could promote it more. Their referral program is really lucrative, check it out if you have the chance, or read my extensive review of them. My AdToll income has been growing as more advertisers discover the value of my Peel Away Ad. I’m now booked out until Oct 7th! I love Peel Away Ads because they are a new and unique form of advertisement. They are also very visible yet not over intrusive. If you want to buy a Peel Away Slot on my blog, the cost is $15 per week through AdToll. MarketLeverage – MarketLeverage is a very loyal sponsor, having secured and continued to renew 4 slots on my blog and would buy more if there were any more available. They also sponsor contests on my blog such as the Affiliate Marketing Challenge. In addition to that, I can’t leave out the fantastic gift package they sent me. I can even recommend signing up to MarketLeverage – I’ve generated over $1,000 with their affiliate network to date. MotiveInteractive – They’ve been my 300×250 Embedded Ad Sponsor since March and have continued to renew every month. They’ve also purchased a paid review as well. Check out my detailed review of them here. 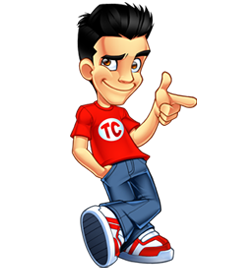 TTZMedia – John Chow has continued to renew his ad for his TheTechZone affiliate program on my blog and has made his way up to the top of my left sidebar. Check out TTZMedia.com and try John Chow’s very own affiliate program. BooksWealth.com – This is their 6th month renewing their 125×125 Sitewide Banner with us. Scott Phelps runs the site and also writes great guest posts here, so if you haven’t checked BooksWealth out yet, maybe you should! SharpWitDesigns.com – Another advertiser who has renewed many times. Need a custom WordPress skin? Check out their colourful designs. For $140, you can order a custom review written by me on your website, service, or product. I cannot guarantee a positive review as it is after all a review and not one long ad. However, you will get the benefit of receiving an entire post written about your company or product in great detail. Every single person that has ever purchased them has been extremely satisfied, with the exception of one advertiser who was angry not with the actual review, but because of the negative comments he received (he wanted me to delete them). Read a post comparing the results of my paid reviews to others here. For the same price, you can purchase a Paid Plug, which is essentially a paid review written by yourself. Grab a Paid Plug or Paid Review! I pride myself in usually being extremely accurate in my predictions. I had predicted that May would finish in the $1,400-$1,500 range, and it ended up coming to $1,431.37. Unfortunately, while I’d love for July to set a new record, I think it will come close, but just a bit shy, around the $1,500-$1,600 range. The only real way that I can set a new record is if I get at least 2 orders for paid reviews. My goal for July is to simply set a new record which would mean making $1746.15 (one cent more from the previous record) from my blog, but that is no small task. Stay tuned a month from now to see the results as usual! That is an excellent start to a recurring income with us! I believe that is only for the 2nd half of June if I remember correctly! Congrats, Tyler! You had a good month. Keep on looking for new revenue sources. I’d actually recommend not focusing on getting paid reviews so much as they will lower the quality of your blog if you do too many of them (nothing wrong with a few a month though). Paid reviews are sinking because Google started slapping sites that are paid/paying. We would do 6 or more reviews each month, and now the company does 1 or none. Because of this we have hired two public relations companies to do the same thing as paid reviews did at one time, but with press released and knocking on doors. Time to open a press release site. Nice stats Tyler…Hope you attain the level you’re aiming for!! Good luck!! Thanks for the sharing your success with us. Keep up the great work. Nice to see that you blog earnings are increasing, even though you didn’t earn as much as you wanted to this month. I wonder how that Market Leverage referral bonus is going to do for you in the future. Congrats! Hopefully you’ll set a record this month! Tyler, congrats on the earnings! And good luck for this month! 1482 is not bad at all. You just a little step about to your target. Cheers, you can do better this month. at least you increased your affiliate earnings. that’ hardest to do. Not too bad, good luck this month and hope you beat your goal. Thanks you for sharing that info – it’s always good to see what can be achieved with hard work. so the contest is a viral marketing souce..
you are earning for organizing a contest 😮 !! Congratulations. Staying above $1,000 a month is a huge accomplishment.